1.Prepare Cream Sauce: Prepare outdoor grill for direct grilling over medium heat (about 400°). In small saucepot, cook garlic and butter over medium-low heat 2 to 3 minutes or until garlic is softened, stirring occasionally. Add cream cheese, milk and salt; cook 3 to 4 minutes or until sauce is smooth, whisking frequently. 2.Prepare Buffalo Chicken: Spray chicken with nonstick cooking spray. Place chicken on hot grill rack; cook 10 to 12 minutes or until chicken loses its pink color throughout and internal temperature reaches 165°, turning once halfway through cooking. Cool 5 minutes, cut chicken into 1/2-inch pieces. In small bowl, toss buffalo sauce and chicken until well coated. 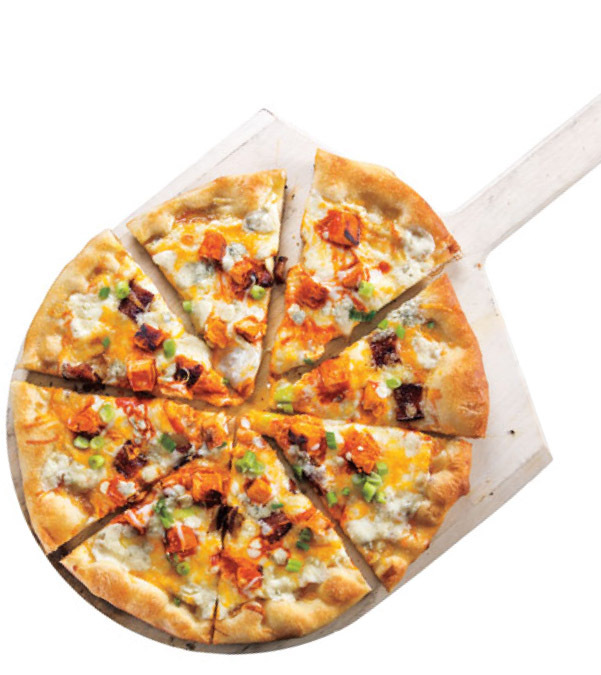 3.Prepare Pizza: Adjust grill for indirect grilling over medium heat. Sprinkle bottom of rimmed baking pan with cornmeal. Lightly flour work surface with flour; place dough on prepared surface. With rolling pin, roll dough to 12-inch round; carefully transfer onto pan over cornmeal. With fork, poke dough several times to vent; slide dough onto center of hot grill rack. Cover and cook 8 to 10 minutes or until bottom of crust is browned, rotating once halfway through cooking; transfer crust back to baking pan. 4.Leaving 1-inch border, with back of spoon, spread Cream Sauce over crust; evenly sprinkle with cheeses, bacon and chicken. Slide pizza onto hot grill rack. Cover and cook 4 to 5 minutes or just until edges of pizza are golden brown and cheese melts, moving pizza crust if necessary to prevent crust from burning. Transfer to cutting board; evenly sprinkle with onions. Cut into 8 slices to serve.